No matter how much I see that brings me deeper into cynicism, I still manage to find things to make me believe, hope, & be thankful for the good in people. The sense of community in times of need. Not just from within the street, nor even just the suburb, but from the opposite ends of the city. Missing: Sam Trott. 2 1/2 years old, light blonde hair, 60-70cm tall. Last seen in Landsdale wearing blue polo shirt & black shorts with a grey stripe. Photo supplied. WA Police sent foot teams, their mounted section, canine section, PolAir, & divers. The State Emergency Service & the Department of Fire & Emergency services had Urban Search & Rescue (USAR), foot teams, canine section, & our great big Incident Control Vehicle. Search Dogs Australia were out too. 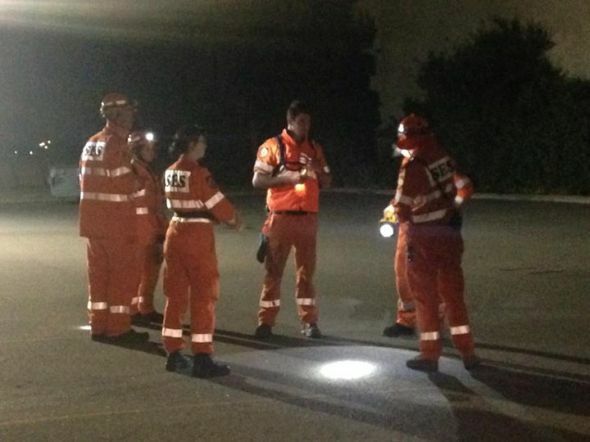 Channel Seven were searching from their helicopter. And then there were the Community. Hundreds of people, all searching for one lost little boy they didn’t know. As a general rule, the State Emergency Service will deploy from the nearest unit, & then call out each unit & district further out as more members are required. But you don’t expect that from the general public. 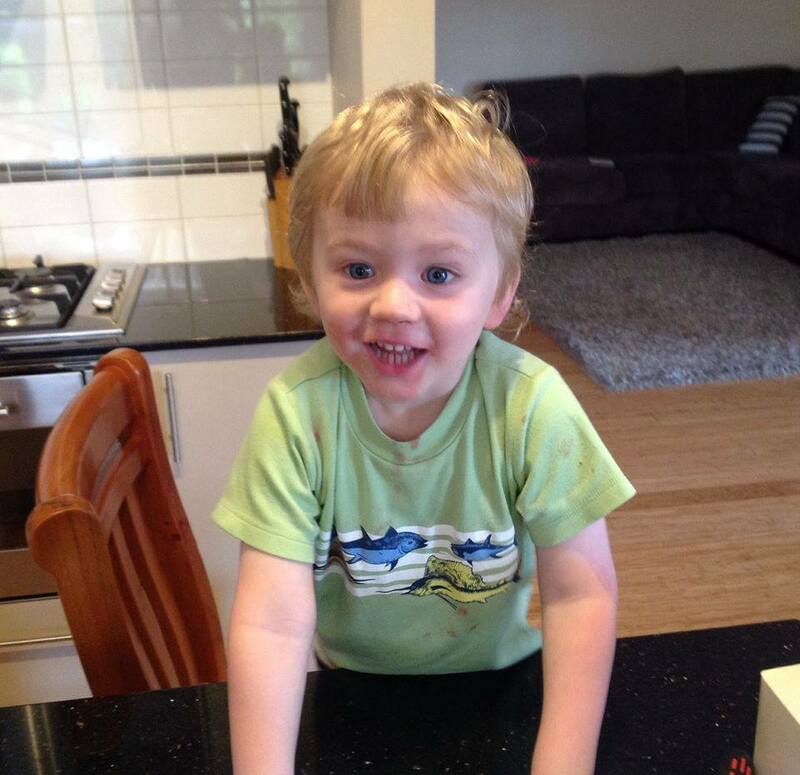 Tonight, there were people searching for this 2 ½ year old boy from locations as far as Warnbro (& possibly further!) who are not volunteers in orange nor blue, nor are they related nor friends with the family, but because they wanted to help. Landsdale isn’t our patch, but we’re the next closest. So we turned out to assist Wanneroo-Joondalup SES & WA Police. I was part of the second team deployed from Stirling, & by the time we arrived the area was crawling with hundreds of people. Mostly just strangers who cared. A boy of about 8, dressed as Superman, followed us as we searched his home for Sam. He looked at us as though we were Heroes, just like in his comics & cartoons. No capes or nylon for us though. Just flame retardant cotton & reflective stripes. It felt strange to get that look. That expectation. Another family who we met as we searched properties had been out helping & searching themselves, despite one of their own children being sick. At Search Base there was a woman who had organised a babysitter for an hour so that she could bring snacks to the searchers. Everything she could scrounge from her pantry & fridge that might be of use to us. “I’d have made sandwiches, but I only had enough bread to make three.” She brought bags of crisps, packets of crackers, & some cheeses. It doesn’t seem like much, but that sentiment was huge. And it was well received at Incident Control. As the sun went down, lighting banks were set up at Search Base, by the community centre. Groups of people armed with torches wandered the streets, lit up with beautiful Christmas light displays. 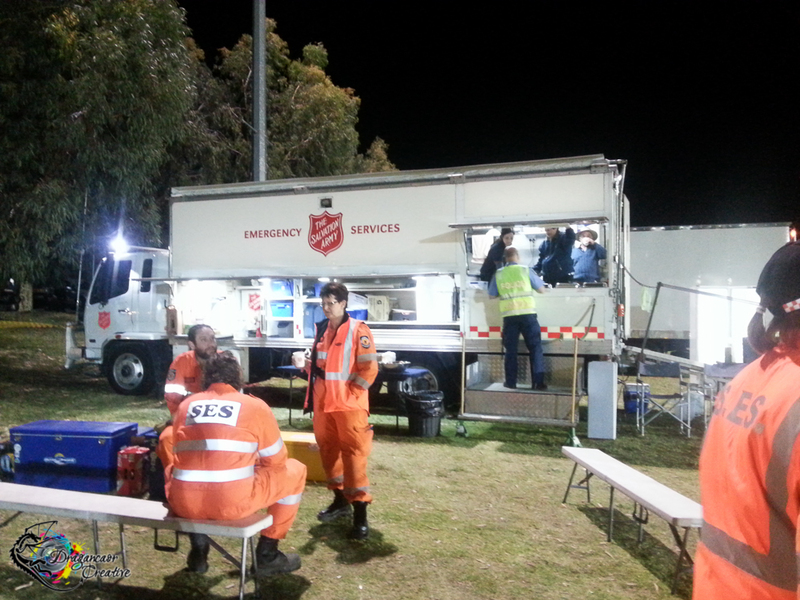 The Salvation Army Emergency Service truck & its volunteers made sure we were fed & hydrated. It’s difficult to explain just how grateful we are for them. It’s the third time I’ve been out where they’ve deployed to look after us, & every time they’ve been so many levels of wonderful. There’s a general feeling of relief when we see them there – we don’t have to rely on the rations we’ve stashed in our pockets – & mouthwatering memories of each time they’ve been there for us. From their friendly smiles & cheerful uplifting banter, to their much needed replenishment. After hours of walking, climbing, & crawling, even cardboard would be welcome. They bring us real, freshly made, good food. Salvation Army Emergency Services Support Truck, Tuesday night. Still we went door to door. Full dark but for the occasional street lamp & Christmas Light Display. Stirling rejigged its teams with the arrival of fresh members. I moved to team 3. We were followed by a white van, as soon as we left search base. It followed mostly at a sensible distance, except at intersections where it made sure there were no cars between us & it. Sure enough, it followed our Troopy all the way out to our sector & parked up nearby. Media. But not the expected vulture-esque media – this cameraman was polite. He asked our team leader if it was alright to film us as we prepped to begin the sector, while we stood around our map & took direction from the Team Leader as to our orders. Manners get you almost everywhere. In this case, it got him The Shot. They’d broadened the search area, yet there were still lots of people out there looking. Armed with torches and hope. A car pulled up & offered us coffee. A local café had opened up, run their machines & sent drivers off with takeaway cups full of exceptionally good coffee. We said no to the first car, but when we were approached by a second we decided to take the offer. Granted I’d been out searching almost 10 hours by this point, but trust me when I say that coffee was good. 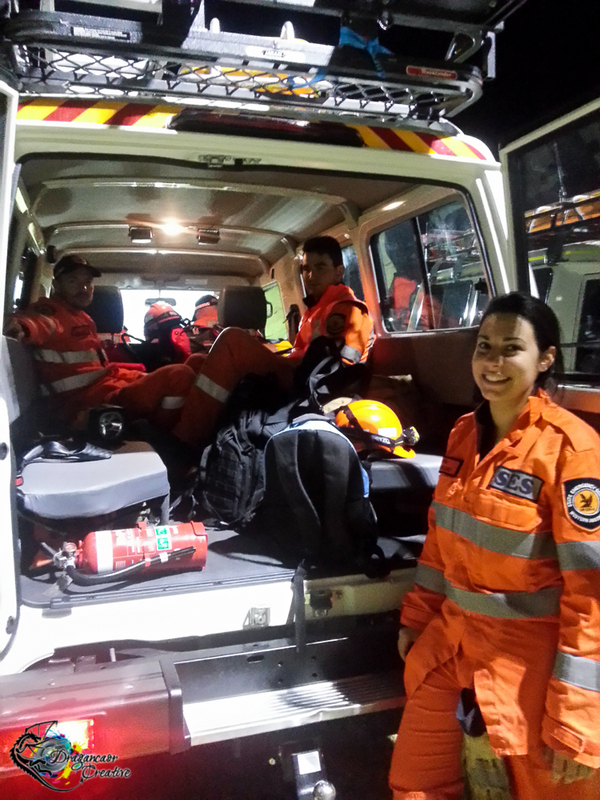 When we finally stood down around 1am, it was purely for OHS reasons. We needed sleep while more recently deployed teams kept looking, so we’d be fresh to relieve them in the morning. None of us wanted to leave, but most of us needed to. Stirling Team 3 & our Troopy as we packed up & stood down for the night, hope still high. In the troopy on the way back to the unit, we looked for news articles on the search. We wanted to see if we could find the numbers of how many of us were out there. Hoping that we’d find breaking news that he’d been found, even though nothing had crossed our radios. Instead, we found ourselves at the top of Channel 9 News’ facebook page. Our team, pouring over the map of our last sector. At home, I found myself still too wound up to sleep. I’m sure we didn’t miss anything, but it is frustrating me that Sam hasn’t been found yet. Over 12 hours missing, after 30 seconds of not being in his mother’s view. I cannot fathom the anguish & worry his family are feeling. I don’t want to know. I wish no one ever had to feel that, or go through this. But I take some comfort from the outpouring of help & support from strangers, as an entire city pooled together to form a community of nameless friends. My normal, healthy cynicism took a welcome hit today. Sam’s face is everywhere. Facebook, Instagram, Twitter, Television, Blog websites, & more. It’s burned into my mind. But for now, I need to sleep. Stirling SES, prepping to search another sector. **Edited to add – I needed to wait until I’d actually slept before I posted this, so that I could check over what I’d written.